Sales expert Gerry Layo says, your customers don’t stop buying. They just stop buying from you. They go somewhere else. But why? The Rockefeller Corporation study found that there are a number of reasons, but one surpasses them all. Indifference! 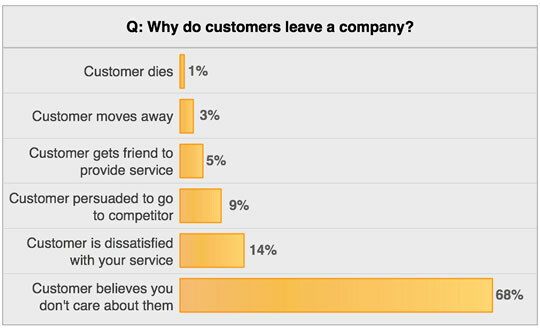 Customers leave because of a “perceived indifference.” They aren’t feeling the love, shall we say. They feel neglected, overlooked, starved for attention. Taken for granted. So how should your company address the risk of exiting customers? You could ramp up your customer touch points, offer a loyalty program, create bonuses, freebies, incentives and all the other usual enticements. Or you could simply listen to your customers. Get to know what their expectations are and then develop an evidence-based strategy for strengthening your customer’s loyalty while improving their customer experience. At Client Insight, we have phone conversations with our clients’ customers to listen and validate their experience. We want to identify what your customer’s expectations are, what they value about your offering and what could improve. In effect, it addresses the number one reason of perceived indifference head on and shows that you care – it eliminates the indifference. Simply the fact that you have hired a third party like Client Insight Inc. to interview your customers sends a strong message to them that you value their perspective. We find out what those expectations are and we have seen clients make the necessary changes to meet and yes, exceed those expectations. We also provide the service of “Lost Sales” interviews, and almost always these interviews provide important insights which shed light on where improvements are needed. If you would like to learn more about turning “perceived indifference” into “expectations surpassed”, give us a call.